My mistake, but it's the Freedom Ace Plus version with the "Horseshoe" shaped coil-plug pattern that will accept the new, Pro-formance coils that are found on the 150/250 machines. I have seen both versions. I apologize for any confusion that the previous mis-information may have caused! Back in the '90s, I picked up a used Freedom Ace plus for about $160. I used it, in desultory fashion for a couple of weeks before I sold it to help finance a 'better' machine. Years later, I picked up a second FA+. Again, with the wolf at the door, I sold it, but not before becoming impressed with its simplicity and unassuming performance. Now, some years later again, I picked up yet a third FA+, with two coils for $100, delivered. After using the heck out of this one, I can tell you that it's a machine that I'll never sell. I'll tell you this, some days when my brain is in 'relaxed' mode, I just don't want to fool with all the TID readouts and whistles. Cherry-picking battery money is the order for the day and in this regard, the FA+ excels. 1) Finding coins in heavy, modern trash... this machine is simply the best I've ever used for snagging dimes next to pull tabs. Many, many times I'll pull a coin out with a piece of foil, etc. in the same hole. 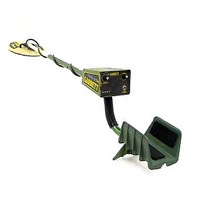 With the 4.5" Sniper coil, you can hunt areas that will give most any other machine fits. Better than even the 250/sniper rig. Hunts right up next to metal playground equipment without falsing. My Tesoros can't touch it in modern trash. 2) Surprising depth! One of my test targets is a dime buried at 5.5" in a nearby park. The FA+ hits it as hard as many "hotter" and more modern machines. Will give that nice 'whisper' signal on deeper coins that we all like to listen for, kinda' like my Tejon. Hits deeper than My Titan 3300 did with way better target seperation (sold the Titan). 3) Fast target recovery. Swing it as fast as you want. Quicker recovery than my 1000 PM. I've used these in competition hunts and done very well. Intuitive pinpointing as well. Just 'X' over the target... it zeros right in. 4) Coil versatility: Mine has the X-pattern coil plug and will use the same coils as my 250. The stock elliptical coil that comes with the 250/150 series works great with my FA+... nice long sweet-spot for covering ground quickly and pinpoints perfectly. Don't pass on the opportunity to get one of these with the X pattern coils pins. Run it with the 250-type "Pro-formance" coil and you've got a coin-sniffing hound! 5) Can be had inexpensively on the used market. Another "sleeper" IMHO. 1) Again, no target ID or notch. Doesn't hit nickels hard anyway. Not a nickel-hunter. Not the best in nails either. You have to run disc. quite high to disc-out big nails. 2) Changing batteries is a pain. Uses 3 nine volt batts and you have to remove the housing cover to get to them. Fortunately, battery life is very good. 3) Stereo headphones don't work. You will need 'phones with a mono switch to hear out of both ears (most 'phones have this selectable function anyway). 4) Primitive design, read: just plain ugly. Has all the aesthetic appeal of a battle-axe. Would like to see Garrett repackage the electronics in a smaller control housing (should be easy with today's micro-electronics) and ressurect this old war-horse. Set it up for AA batts like the 250 while you're at it Sir Charles. For an old design (I last saw these for sale new in the mid-nineties) this machine is a coin-sniffing, battery-money hunting hound! One of Garrett's best machines ever. When you get tired of all the bells and whistles and just feel like listening for coins, give this ugly old green-stick a try. One last bit of advice: if you get the chance to check the machine out prior to purchase - go for the X-type coil pin pattern and try the pro-formance coil on it. Also, you want a machine that falses at maximum sensitivity! The ones where you have to reign it in a bit to get quiet operation are the ones you want, they will tend to be 'hotter' than those that run smooth at max sensitivity. You'll be able to tweak it up for the very highest sensitivity on your sites. Mine will bang a quarter 9" out in the air with the stock coil.